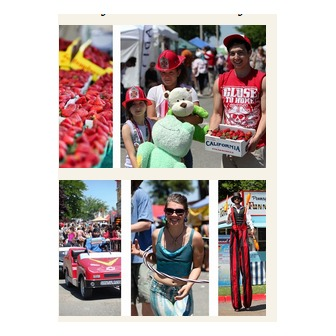 Celebrating the Harvest of Berries; Great food, contests, shopping and exhibits for the whole family. We won't ship in any Strawberries. Local farmers will harvest extra strawberries just for us. These are certified organic and local from Placer County and some ordering counties such as Sacramento, El Dorado, Yuba Santa Cruz and Sutter Counties. We will also pre-sell Strawberries at wholesale prices to the vendors of the festival to insure all Festival Strawberries are local grown. All Strawberries are sold by the Farmers themselves. BerryFest, Festival of Strawberries is dedicated to "the best mother, the best wife" My Mom, who was the first girl to ever love me. And to my Dad who was forced to be mom and dad when we lost our mother and raised my two sisters and I from when we where two months old to seven years old all by himself. Address: 800 All America City Blvd.